donkey poo - Looks like poo. Tastes like heaven. Looks like poo. Tastes like heaven. After making donkey poo for her friends and family for years, Lorraine has now made donkey poo available to the world! There is no diet version of donkey poo, it is just a purely indulgent cake type of dessert snack. 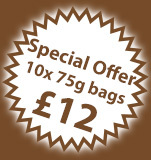 donkey poo comes in bags of 75g. Your donkey poo will be sent to you in the post! Postage is included. Copyright © 2019 donkey poo. All rights reserved. 'donkey poo' and the donkey poo logo are registered trademarks.